Dining by night in a revolving tower restaurant provides spectacular, twinkling views, especially with Niagara Falls illuminated until midnight during summer. Come morning, my mood changes. Seen from the 24th floor of my hotel, the magnificent vista over the great curve of the Horseshoe Falls is sullied by the sight of black plumes of smoke rising above the city of Buffalo in New York State while, below me, the mighty cascades are encircled by a vast apron of concrete, a network of roads, hotels, shops and tower blocks. It’s a drab landscape with rare green relief. Here’s my advice. If visiting the falls, stay on the lake. Niagara-on-the-Lake is just 20 minutes drive away. It’s the official ‘prettiest town in Canada’ with an historic Old Town and about 3000 residents. It’s heart is Queen Street, akin to a folksy movie set complete with Clock Tower, glorious flower beds, a famous fudge shop, tea rooms, Preservation Fine Arts Gallery, an apothecary museum and antique shops -all of which act as counterweights to the inevitable gaggle of chintzy souvenir shops. Off the main thoroughfare are many old graceful homes, their splendid gardens flush with magnolia blossom, the streets dipping towards tranquil river frontage. I see a couple stop to embrace beside the wooden pavilion made famous in a Stephen King movie. I’m smitten by the slightly surreal appeal of small town Canada. For me, there’s a “double delight” adding to this natural charm. 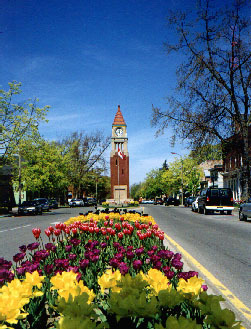 Niagara-on-the-Lake sits square in Ontario wine country with many a fine cellar door to visit. And each year it hosts “the Shaw”. 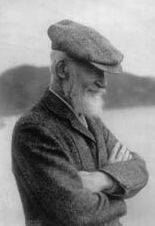 The town’s adopted theatrical son is George Bernard Shaw and the annual Shaw Festival, which runs in repertory from April to November, attracts thousands of theatre lovers from around the world. In 2011 it celebrated its 50th anniversary. The diverse bill for 2012 includes Shaw’s plays The Millionairess and Misalliance, Ibsen’s Hedda Gabler, and the musical Trouble in Tahiti, with libretto and music by Leonard Bernstein. Devotees come to town exclusively for the Shaw and nothing else. But most tourists see only a couple of plays during the time they’re in town. Whatever your choice, putting Niagara-on-the-Lake on your travel wish list is definitely a wise move. 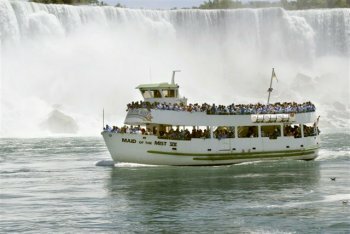 The demise of the Maid of the Mist tours from the Canadian side of Niagara Falls is a shock to anyone planning a visit there in the next couple of years. These famous and extremely popular tours have been running since 1846, using sturdy, tug-like craft that brave the turmoil of the river and sail into the mist-shrouded maelstrom at the base of the thundering Horseshoe Falls. A ride aboard the Maid of the Mist is a highlight of any Niagara visit. A bidding war has seen the company lose its long held contract for boat operations in the river gorge. Instead, a 30-year agreement has been signed with Hornblower Canada. It has plans to introduce two new boats, each carrying 599 passengers. But it also means Hornblower tours are unlikely to start until the spring of 2014. Maid of the Mist president Christopher Glynn says the loss of the Canadian contract has created many uncertainties, including whether Maid of the Mist tours will operate this year. The boats usually run from late April/early May (weather dependent) to October. Meanwhile, Hornblower says its new boats will have enhanced passenger facilities, including “dry zones” offering passengers protection from the swirling mist. Well that certainly removes an elemental part of the Niagara fun – getting thoroughly soaked!